Select a question below to a see the answers to some frequently asked questions. 1. Who can play Laser Skirmish? 3. How do you know when you are dead? 4. I am not keen on shooting each other - will it encourage violence? 5. Do your staff have experience with young people? 6. Are there any hidden costs, such as having to buy extra ammo? 7. What happens if it is raining? 8. Do you get bruised? 9. What do I wear/bring? 10. Where is Wide bay laser Skirmish? 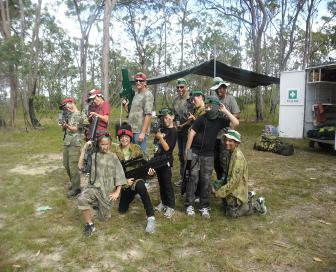 Laser Skirmish is designed for all ages (kids, teenagers and adults) and abilities to play. 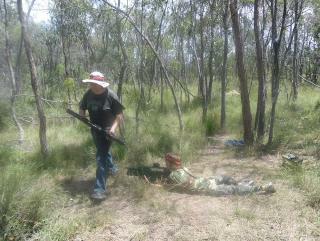 Executive team building groups, cadets, scouts, youth clubs, sports teams have all enjoyed Laser Skirmish. Fitness levels are not a major issue as everyone can play to a level that they find comfortable. Considerations are given to people with physical and intellectual disabilities to ensure that they have the full laser skirmish experience also. We have different sized guns/taggers to choose from. 2. How do the gaming guns work? There is no paint, no mess, and no projectiles, so you can be sure that your team is playing in safety. Our weapons are formidable because they are made of metal so they look cool. Our small guns are highly manoeuvrable. With an effective range in excess of 150 metres, realistic digitized sounds and multiple modes of fire this is technology with attitude! We have a selection of guns for use. The guns we use include: Scorpions, Commando Carbines, Pulse rifles and Morita Sniper Rifles. The size and weight of weapon issued to you will depend on your age/size/fitness etc and will be evened up across the competing teams to make it balanced. 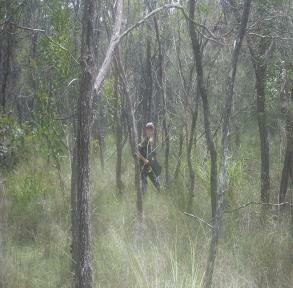 The equipment is the best available in Australia. A sound like “Arrrrrrrrrrrrrrrrrhh” emits from the guns itself to signify that you are dead. When this happens you need to find your Medic to get respawned or a new life before rejoining the battle and being able to shoot again. You are killed by being hit at either of the 3 sensors – one on the gun and the other two on the front and back of your head band over your hat or bandanna from friendly or enemy fire. You will be cheating if you cover up these sensors during the game. exercise and outdoors experience, rather than sitting indoors, shooting each other in computer games. 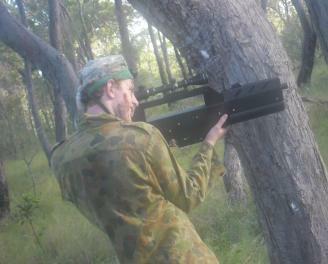 In a Laser Skirmish environment we do not tolerate violence or foul play. It's a non contact sport. Secondly, and most importantly, it is a team building game - there is no individual scoring. Teams must plan and work together which is a real bonding experience. Then everyone that leaves Laser Skirmish with huge grins - not pent up aggression or frustration. 5. Does your staff have experience with young people? Yes. We believe in having fun but doing it safely. Our referees have experience in working with young People from all ages, abilities and disabilities e.g OHSC, Scouts, Intellectually & physically disabled as well as being parents. Most are big kids themselves even over 40++!!! We usually have one referee per team (there are usually 2 teams) plus a Commanding Office (or C.O. for short). We increase staff numbers for larger groups. We ensure that our referees running youth events all have current Blue Cards and are fully trained. No! Your referee will load up your gun with enough lives to get you through your game. Laser Skirmish provides players with everything they need for the event, and unlike paintball, all the necessary ammunition is included in the price. We play in all types of weather (rain or shine); however we do recommend that you bring a towel, or change of clothing with you. In fact we have been told many people love it when it rains because it is more authentic. Our guns are water resistant. If it rains, we can provide waterproof ponchos. We will stop play if there is an electrical storm for safety reasons and wait to the storm passes over. Our guns emit infrared, just like your TV remote. So the beam of light is invisible and harmless. So there are no bruises from being hit. No pain, just a lot of fun. Everyone must wear long trousers (such as jeans) past their ankles. Also everyone must wear covered footwear. If you have hiking boots wear them, if not runners are okay. You should, of course, try to keep to camouflage or neutral tones, so that it's not too easy for your enemy to spot you! adrenalin really gets going. You may wish to bring sun-cream in warm weather. It's very important to remember to bring your Membership Forms, signed by the parent or guardian of each player. Unfortunately without them, players will not be able to take part. You might also want to be bring a water-bottle, we provide water for free, so you can re-fill when required. You may wish to bring some money with you too, as we sell drinks, etc. in our Quartermaster's store. We also sell combat BDUs etc (you will need to pre-order). Don't bring flashy jewellery .. 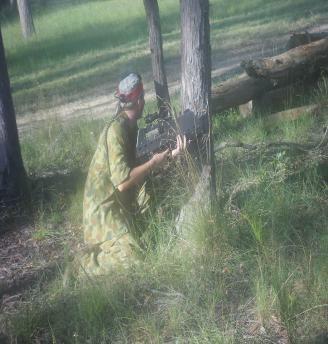 Wide Bay Laser Skirmish will not be responsible for any loss, theft or accident to player’s property. 10.Where is Wide Bay Laser Skirmish? We can play in the forest, run mobile around inflatables, or for private groups at our own fields or on your own property. Minimum area size area needed would be about the size of a tennis court for inflatables. We do travel to all areas in the Wide Bay Burnett area which includes: Hervey Bay/Maryborough; Childers, Bundaberg, Gin Gin, Biggenden and other places as Monto, Mundubbera, Eidsvold in the North/South Burnett areas. For other areas such as Gympie, Gladstone and Rockhampton, please contact the Enlistment Officer on 4126 3222 for more information. · Full Service includes staff and equipment hire. We can cater for both Woodland and Inflatable events for private sessions on your own property or business premises.